Sky VIP has launched in the UK this week, offering all manner of customer benefits and bonuses to people with Sky TV or Sky broadband. The loyalty scheme gives Sky customers the opportunity to grab tickets for sports events and live music shows, exclusive previews of top shows like Game of Thrones, and free entry to regular prize draws. Anyone buying a new deal with Sky broadband or TV will be eligible for the Silver package, while customers who have been with Sky for longer will reap more impressive rewards. Existing customers should already have had an invite to the Sky VIP service by email. If you’re a new customer all you have to do to join is to download the My Sky app and then log in. You’ll quickly get a list of the bonuses you’re eligible for. 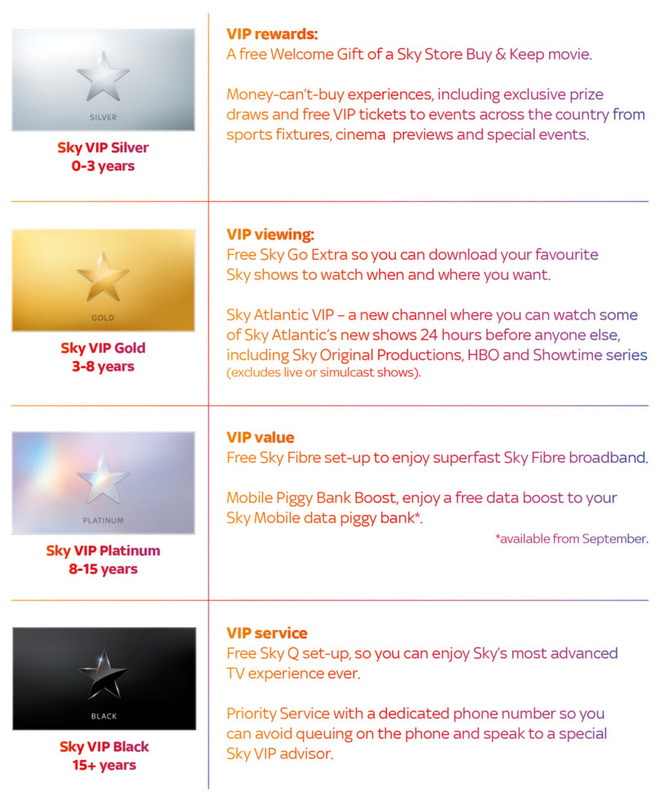 People who have stuck with Sky for over 15 years will get the highest tier of rewards – Sky Black VIP. Three other versions of the rewards package are for newer customers. Sky Silver (0-3 years), Sky Gold (3-8 years) and Sky Platinum (8-15 years). Households who qualify for Sky Black will be able to upgrade to Sky Q for free, while Gold members will get access to a new preview channel called Sky Atlantic VIP where customers can watch new shows 24 hours before they air. Other perks include a monthly giveaway of tickets to dozens of Premier League and Football League matches, with tickets handed out on a first-come-first-served basis. Stephen Van Rooyen, Sky’s UK and Ireland Chief Executive, said: “This isn’t about tactical deals or collecting points – it’s about offering genuine experiences and benefits we know our customers value and which only Sky can offer.